Thanks for the really useful walkthrough, I came across your blog part-way through implementing an almost identical solution. I wonder if you came across a situation where Amazon were re-using the same Private ASN in their BGP advertisements from two different VPCs? I am seeing that routes aren’t propagating between VPCs when the same ASN is set for the remoteas and hoping there is an obvious solution I am missing? Faced the same problem as Jim described. I was able to connect two vpcs located in California and Ireland with routing working fine, but then I also connected Sydney which was able to establish ipsec, but no routing was happening. What I found is that the remote-as number for California as well as Sydney were 72249. since this is not in our control, it can mess up the bgp routing. Still trying to find a solution to it. Safeer, we have the same BGP ASN 7224 for two of our regions. And in the hub-spoke model, it doesn’t seem to cause any issues! Unfortunately, we do not have separate AS number for every regions. Some regions do use common AS number. The only thing you can do here is to remove the AS number 7224 (by overriding AS Path) before advertising it to other peers. You need to perform this on Vyatta device. This way other BGP peers will accept the prefixes advertised (since they do not see their own AS number in the AS PATH) and will install them in route table. I looked for command on Vyatta CLI which can override AS_PATH but was not able to find any. You can contact Vyatta support if they have any specific advice for your scenario. Other alternative, if it is feasible for you, may be to use Cisco CSR 1000v in Oregon VPC. It does support “as-override” which will serve your purpose. 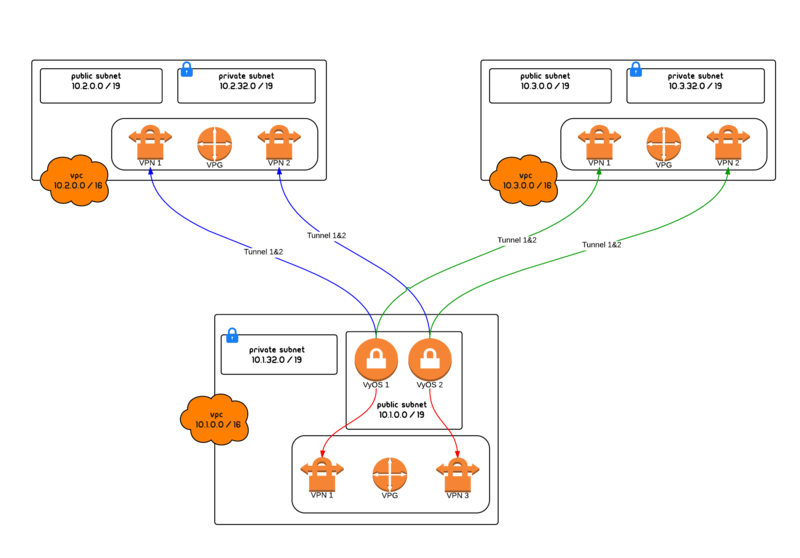 if you don’t mind, can you please post your bgp summary from vyos? Let’s say I have a direct connect coming in the hub vpc, how do I manage to have packets going between the spoke vpcs and the network at the other side of direct connect ? Safeer, if I understand you correctly, you are letting your routes propagate all the way through. In our case, we are advertising the whole 10/8 subnet to all regions. May be that is the difference! What would be 10.Y.0.1 ? I understand 10.X.0.0/16 is the vpc in which vyos instances are hosted. I had the same question. What would be 10.Y.0.1? how do the instances in the subnet know which VyOS device to route through when the first one goes down?! You should be able to terminate VPN connections in public subnet VyOS. You can specify a static IP address when launching VyOS using AWS console or API. I can specify it in the instance and when I run an ifconfig I see that eth0 is set to the correct IP, but when I go into the Vyos config and try to remove DHCP and add the private IP boots me out of SSH (makes sense since WAN link is changed) and then I can’t get in till I restart and the non-saved config file rolls back. I am probably missing something stupid here. BTW, your site is extremely useful and well created. Thank you! In that stanza, does the 10.X.0.1 stand for the VyOS’ own internal IP address? Amos, no it is the destination for subnet default router for Vyos. If Vyos is in 10.5.6/24 subnet, Amazons black box route destination will be 10.5.6.1. Thanks. That solved a problem I had accessing a local subnet. Now I still have to figure out why VyOS doesn’t forward traffic from any other instance on its side of the tunnel over the ipsec tunnel to the other side. This post was really helpful and awesome. It’s a huge improvement over my single openswan instance with static routes that I was using before to connect my vpcs across regions. I can’t believe we’re almost half way through 2017 and AWS still has no service for connecting vpcs across regions! Anyhow, one question I had: Let’s say I have 2 regions in Europe and 2 regions in the US that I wanted to connect all together. In your above scheme, all the regions would be connected through the single hub region. Let say, I created my hub in a US region. Then traffic between my two regions in europe would have increased latency since they have to travel through the US hub first. I’m curious if you solved this problem at all? Is it possible to have multiple hubs, but still have connectivity to all regions? Chris, I would use peering in this case. You should use vpc peering for peer vpcs and should not let this traffic get on vpn. Chris I use virtual GW as the hub on my setup. In your case I’d create a hub in each continent and let bgp figure out the best route. See https://github.com/amosshapira/thermal for a working automated example of how I do this (I use single VyOS instance on each spoke but have an AutoScalingGroup watching it and bringing it up automatically if it stops). Thank you very much for these usefull informations !